I visited Wharram Quarry earlier this week and whilst marvelling at the huge orchid display, I reflected on Thomas Rainer and Claudia West’s book and what lessons landscape architects can learn from places like this. “For a building to be motionless is the exception: our pleasure comes from moving about so as to make the building move in turn, while we enjoy all these combinations of its parts. As they vary, they column turns, depths recede, galleries glide: a thousand visions escape.” Paul Valery, quoted by Steven Holl. 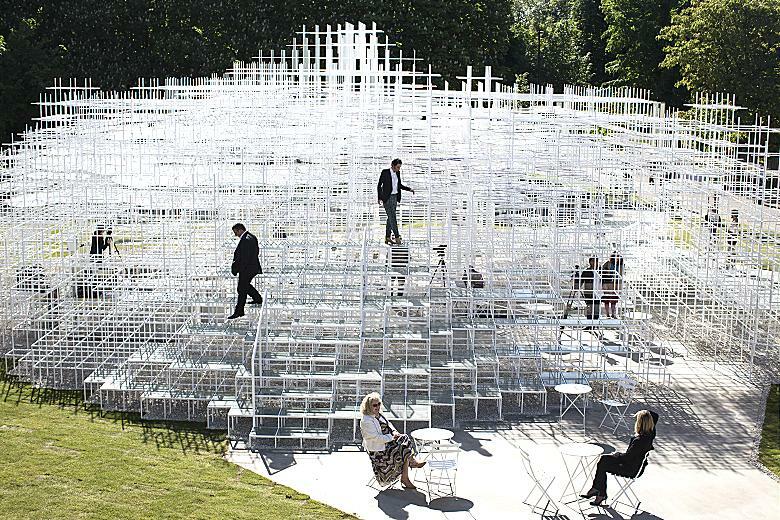 Earlier in the summer I saw Sou Fujimoto‘s Serpentine Pavilion. On the Serpentine Gallery website, Sou Fujimoto describes the pavilion as “A really fundamental question how architecture is different from nature, or how architecture could be part of nature, or how they could be merged…what are the boundaries between nature and artificial things.” The accompanying press talked about the cloud-like form, the way the structure blended with the landscape and so on. Whilst thinking about blurred boundaries and enmeshed experience is cat nip for Spinozists and Landscape Architects, I was more excited for another reason: it was simply fun to be in, and reminded me immediately of the best climbing frame I ever knew. Growing up, my sister and I went to church every weekend, and the Sundays I looked forward to most were at Little Yeldham because afterwards we could play in the park. 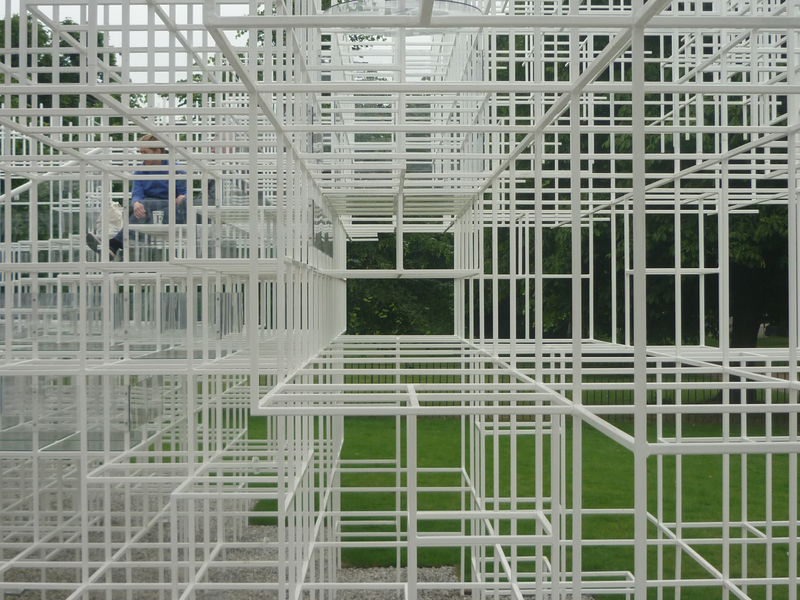 At the park was a brutal version of what Sou Fujimoto built: a 5x15x15m cube, with larger spacings in the grid and composed of 40mm scaffold tube, set in a massive concrete bed. It was lethal, but so much fun: you could climb, chase, jump, twist and hang in every way you could think of. A simple structure, cheap and easy to build, and perfect for Sundays (which are all about your imagination). Sadly, you can’t really climb Sou Fujimoto’s pavilion, except where directed, and the centre has been left open to make space for coffees and sitting around, but the joy of passing through it is just the same. 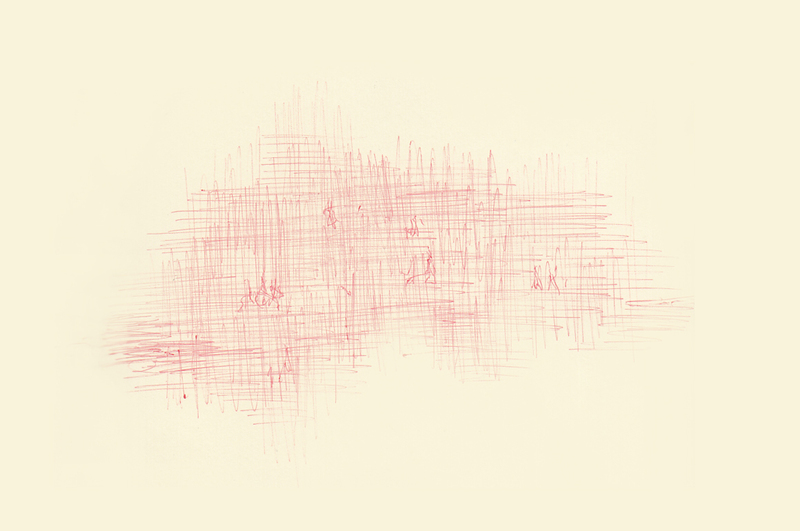 Every movement around the piece changes your understanding of the whole, lining up different sightlines, watching people appear and disappear. Seeing the building move reminded me of a line quoted in Parallax, leant to me seven years ago by Jeff Logsdon, our tutor at Writtle, and remembered since: “a thousand visions escape.” The book that Holl took that quotation from was the Introduction to the Method of Leonardo, and for the last seven years I’ve looked for a copy of it in every bookshop I’ve visited to learn what philosophy this beautiful turn of phrase fitted into. Finding out more about the book was difficult, and the few references to it online all quote the same couple of lines as Holl. Very few were published, making the book all the more enigmatic, and the more I thought about it and looked for it, the more I wanted to track it down. By chance the same weekend that I saw the pavilion I found a copy in Collinge and Clark– in the frontispiece it says that fewer than 900 were translated into English (hence the seven year search). Expecting a massive tome, I was surprised to hold it in the hand: it’s so thin. Writing in 1894, Paul Valery investigated the process of invention: how do we create, why is it that some are better at it than others, and above all, why was Leonardo so great at it? What processes did he go through, and how can lesser minds understand one that seems to operate on a different plane? During the course of his inquiry, Valery considers Leonardo’s obstinate rigour and his polymathy, but ends with an investigation into Leonardo’s psyche. Searching for the best way to understand the “intercommunications between the different activities of the mind“, he considers Leonardo’s different talents and exercises, but concludes that “it is through the building… that we can best realise the clarity of a Leonardesque intelligence.” For Valery, Leonardo’s genius was made possible by his rigour and his polymathy, but at its root was the ability to move quickly between the concrete and the abstract. Deep considerations into the nature of matter and energy led to insights into philosophy and back to construction; thinking about Leonardo’s designs for a cathedral were the best way to understand this. Valery noted that buildings and cities are often designed and generally used in a state of abstraction (or distraction): most users only consider a part of an entity if at all. We might consider the decoration of a public building, the view from a window or the shade under a tree, but rarely is the whole considered. Valery saw that new sightlines are revealed in turn and that to consider the whole one needed to move. There is a profound symmetry between the creative process and the use of space. In the same way that the user moves through a space, sees new lines and makes a place, the architect first considers the problem of construction, then properties of materials and future uses, and passes to profound questions of mechanics and physics in general: in each process there is movement between observation, consideration and discovery. Whilst Paul Valery was writing about the studies of buildings, I think his observation is more powerful when applied to landscape: landscape design is art on the greatest scale. The energisers of our work are what other professions consider the mess of life: shed leaves, meltwater, the launch of a canoe, bat roosts and so on. Our palette of materials releases glimpses of a whole that evolves through months and seasons. Constantly changing, our work often makes sense only at scales we can’t ordinarily comprehend, and demands from the designer a balance of delicate understandings, of the abstract and concrete. Post script. Reading The Method of Leonardo did not take long (it’s only 69 pages) but it took a long time to find the paragraph that contained the quotation I’d read in Parallax. When I did find it, I found that Holl had changed the line to something more succinct but different to the original. Perhaps it reads better, but interestingly all the places that I’ve found that quote Valery’s Introduction to the Method of Leonardo use the quotation as Holl used it, rather than as it is in the original translation. Perhaps all those academics and journalists have been a bit quick with the Ctrl+C / Ctrl+V. Either way, it points to the danger of quoting sources you haven’t read and the potential for quoting someone out of context. There are so many interesting and provocative thoughts in this short book, and I really recommend tracking it down if you can (if not, get in touch and I’ll lend it to you). I’ve just finished rereading Gardens of the Mind. Printed in 1992 and now out of print, it’s a measured walk through the life and works of one of the Twentieth Century’s greats and one of only two landscape architects to receive a blue plaque from English Heritage. Reading about the evolution of a great mind, it’s hard not to feel inspired to try and stand on his shoulders. Others have written how he helped establish the profession, and how far he took it on, whilst others have questioned his relevance to us today beyond the field of landscape history. You can already guess which camp I’m in and what I’ll have thought of this hagiography, so I don’t want to write a book review here, rather give a few observations on Jellicoe’s work and his legacy for landscape architects. The first is to note that whilst he was the first of only two landscape architects to get the blue plaque, was knighted and so on, his wife seems to be constantly marginalised: even in this book, Susan is usually referred to in passing as ‘having done the planting designs,’ and whilst Spens notes she was a good plantsman, this is normally the limit of the praise she receives. It’s hard not to feel that she was hard done by: the Jellicoes were in every sense partners, and in their immediate circle this was understood. Their most famous book together proclaims both authors equally and gives you an idea that they recognised their mutual dependance, but it rankles nonetheless. The success of landscape and garden design relies ultimately on the quality of plantsmanship: the plants are the paints that make this the greatest of arts and carry the meaning: for a team like the Jellicoes who often painted with allegories, this skill was even more important in making their work legible. For Susan! Designing with allegories was frowned on when I was at college – I don’t know if it still is – and seen as a slightly undergraduate tool. Perhaps that’s why the Jellicoes weren’t discussed by my tutors? Imaginatively and thoughtfully done, I don’t have a problem with it, and depending on the garden’s users it can be enormously powerful – but to be successful, it needs to be planned in forensic detail so that every plant performs to tell its part of the story. But what happens when a plant dies back, sheds its leaves, or goes dormant? It made me reconsider what we now call successional planting – instead of trying to create a ‘year-round spectacle’, isn’t it better to allow a border or area of planting to be at its best at a certain time of year, time of day? And if we design a part of a garden to look its best at a certain time, how do we manage that garden when it’s not at its best? One of the persistent themes in the book is Jellicoe’s ability to keep moving ahead of the pack: he researched and wrote the pioneering textbook on the gardens of the Italian renaissance with Jock Shepherd after graduating from the AA, developed an English modernism in the 30s at Cheddar Gorge, created ingenious classical pre-war gardens, and after the war set a template for multi-disciplinary design practices, with an office addressing town planning, architecture, landscape architecture and garden design and relentlessly pushing modernism forward to post modernism and then further forward. 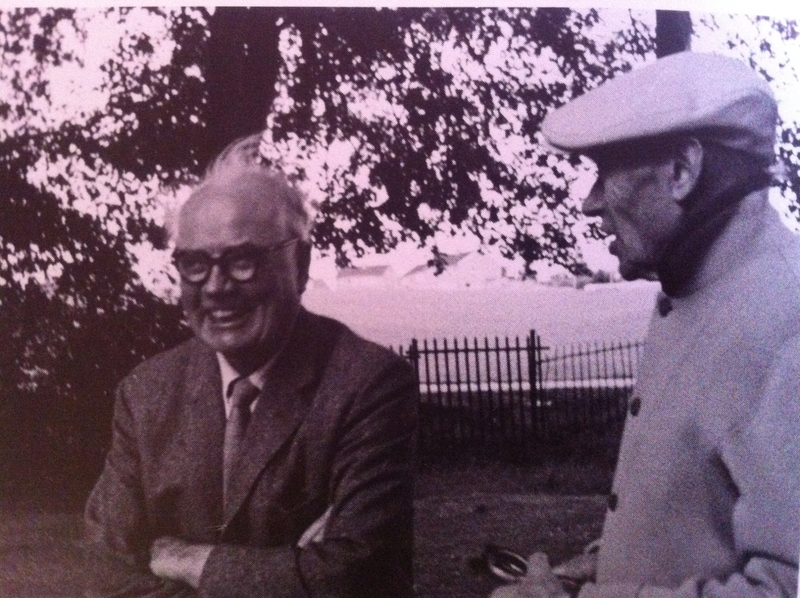 We read about the influence of his friendships with Henry Moore and Ben Nicholson, and the importance of Paul Klee’s work on him (“it’s like electricity in my veins”) and Jung’s Psychology of the Unconscious – and these have been widely written about – but what struck me was the confidence it took for clients to work with a mind like Jellicoe’s. His reputation counted of course, but for a patron such as Stanley Seeger at Sutton Place who held the excellence of historical architecture and landscape at a high premium to instruct Jellicoe demonstrates a real confidence in his own time to interrelate the past and present. Such clients are rare, and it’s little wonder that the commission was so decisive for Jellicoe. There are few biographies of landscape architects (we tend to see carefully edited practice retrospectives), so it’s rare to see recorded the sheer quantity of abortive work that a practice carries out at every stage of the design process: we evaluate tenders, submit bids, develop feasibility studies, outline plans and detailed proposals and at every stage there’s the possibility a client will withdraw the instruction, appoint a contractor to take over, have a change of heart… And finally when the garden is built and planted, gardeners may not garden as the designer instructed. And when set beside the amount of time we spend in meetings and hitting the admin of emails and just getting on with colleagues, it’s amazing how much time we spend working on projects that don’t end up as we hope or plan. But here, Jellicoe’s failed tenders, feasibility studies and proposals are included alongside the successes – some have a whiff of hubris, others make you wish this whirlwind of insight and self-improvement had somehow been given more time.